Laminated flooring consists of performance rated for commercial level and other range of performance levels. Its warranties last for 10 years or 20 years and some even lifetime which is based on your type of laminated flooring. The wear layer that shields its floor from fading and stains. The inner core layer’s plastic resin stabilizes and flattens the laminate for maintaining structural strength. With its backing, a moisture barrier is created to shield the floor from warping and it is this layered construction which causes these floors to last longer. With its multilayer construction, wear, indentation, scratches and stain can be prevented more effectively from active children, pets and etc than many other flooring types. Laminated flooring has a very easy installation steps. Most of the laminated flooring can be install over wood, tile, concrete and many different surface as long as it’s flat and level surface. And the installation only involve using some glue. Laminated flooring it’s easy to be clean and it does not capture dust like what carpet did. 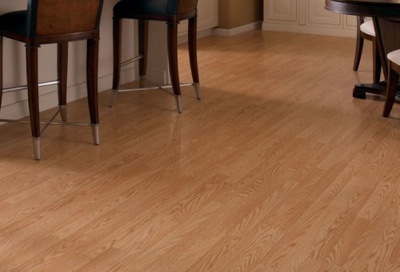 So for those who are allergic to dust and dust mite, laminated flooring is one of the best option for your flooring. If you are thinking of to save some cost for renovating floors, then laminated flooring is a great choice for you. Mainly because it can be install in many different locations and the price is cheap compare those carpet and others. This entry was posted in Flooring and tagged floor renovation, flooring, laminated floor, laminated flooring, laminated flooring renovation by Renoman. Bookmark the permalink.